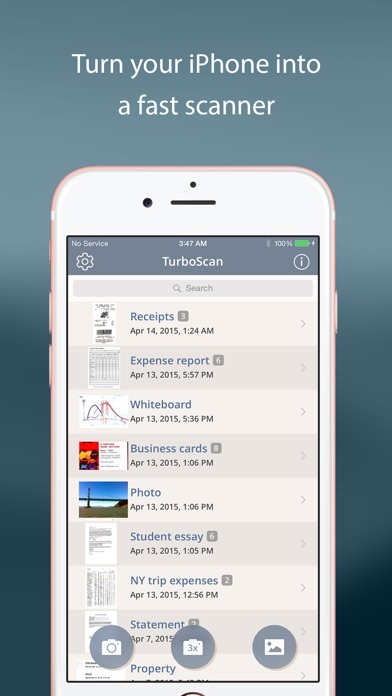 TurboScan turns your iPhone into a full-featured and powerful scanner for documents, receipts, books, photos, whiteboards, and other text. 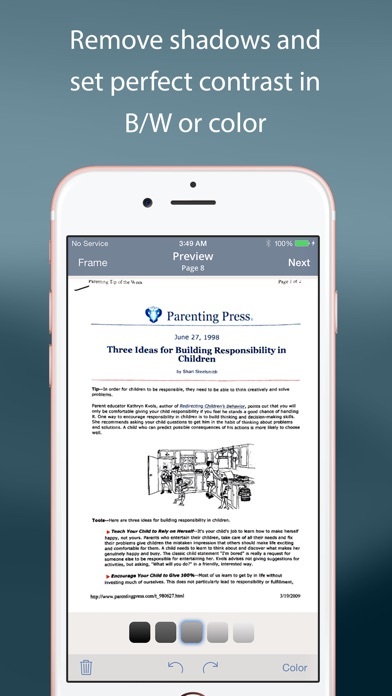 Using just your iPhone or iPad, you can quickly scan your multipage documents in high quality PDFs or JPEGs, name, store and send them anywhere. • "I was going to buy a Quick Scanner so I could go paperless, but this app has just saved me hundreds of dollars" (TurboScan user) • Featured in The NY Times, CNN Money and The Telegraph. TurboScan uses advanced fast algorithms to accurately detect document edges, straighten them (correct perspective), eliminate shadows and set a perfect contrast for text - black on white. Color and photo modes are also available. TurboScan boasts a powerful yet easy to use interface. Get instant one-tap brightness, rotation and color controls all on one screen! TurboScan also offers SureScan, our proprietary scanning mode for sharper scans (especially useful in low-light conditions.) SureScan automatically takes three pictures of the same document, giving you guaranteed perfect result every time. TurboScan's handy "Email to myself" feature lets you routinely send documents to a predefined address with one tap, or even upload them to online storage sites like Evernote. All processing happens on your iPhone, and the confidentiality of your data is never compromised (no Internet connection needed.) TURBOSCAN FEATURES: • Automatic document edge detection and perspective correction • SureScan 3x mode for sharpest scans • Document naming, storage inside the app and smart search • “Email to myself” feature for quick routine emails • Add and reorder pages at any time • Arrange multiple receipts or business cards on a PDF page for printing, etc. 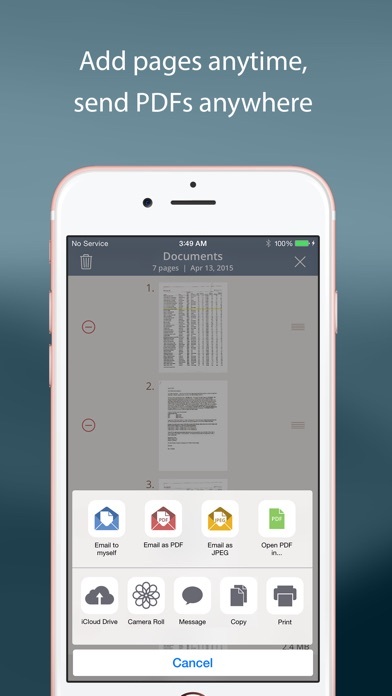 • Send fax option (uses our Turbo Fax app) • Email or message documents as PDF, JPEG, or PNG, or save to Photos • Touch ID & passcode lock • Upload, auto-upload and backup to iCloud Drive • Open PDFs or JPEGs in other apps like Dropbox or Google Drive to send to clouds • Copy & paste scans to other scans or Clipboard, and merge • AirDrop function (press Open PDF In...) • Printing via AirPrint or printing apps • Compact attachments with adjustable size • Ultra-fast processing (under 4 seconds per page) TIPS ON SCANNING • Make sure your document is flat and well lit. • For best edge detection, include some margin around your document while shooting. • Use flash in low light conditions, but avoid glare with glossy documents. We're constantly improving TurboScan, and we value our customers' opinions and feedback. Please email us at support@turboscanapp.com. Thank you! Very easy to use. Saves so much time and helps me organize things quickly. Not tied to my desk anymore. Love this app. So easy and quick! It is convenient and useful! Much easier than my large scanner! So easy to scan and send. I use it for everything! I love you TurboScan for making me look stellar when PDFs are needed at critical times and in remote places! You’re the best!! I am a landlord and love it. Can scan docs on the fly and upload to cloud. The paid version is worth it Deff. After purchase you will very quickly be locked out until you upgrade for only $7.99. You have the option to restore original purchase but You will still be locked out until you upgrade. Shady app. for sure. TurboScan is a tool I use regularly to scan documents, turn them into a pdf document and send them around. It is a very simple and user friendly tool which I can highly recommend. I use it on my iPhone. This app makes it possible to save and send documents with my iPhone. I find it indispensable! This is the best app I’ve ever used, it really saved my life!!! I use this everyday for work!! Much better than tedious faxing!! Easy and fast!!! I bought this app to easily scan and send something in the same app. But when ever I email anything to either myself or someone else it gets lost in no mans land and the email with attachment never gets sent. I try to email the scans I take and it is not working. My app is updated so not sure why this isn’t working. Love this app! So much better than struggling with scanner on my printer. Excellent app, but definitely NOT free! This app will only allow a few scans and then you must pay $7.99 to continue. Disappointing. Works like a dream for what I need it for. I take a picture of my work report and email it off, easy peasy! By Lou The Magic Man! The best!!!!! So easy to use- love it. You can send PDFs via any email platform. But if you want to directly email any other scan, you must use *Apple Mail* only. Don’t be like me, Outlook and Gmail, and pay for it. Does great scans however. I am disabled on a fixed income, and don’t have an at-home fax machine. The need to fax or email a document only comes up occasionally. This app has saved me on every one of those occasions! It’s simple to use, even for us technically challenged seniors! This app has saved me so much time many times over. It is user friendly and seems to do everything I need it to do. Perfect for what I need. Does a nice job, with multiple pages as well. Love how convenient this is when I am traveling or on the run. Easy to use, great quality! This app was a lifesaver for me when I was a new widow and had to have documentation all the time or to take pictures of documents I might need. I also have pictures of my passport and marriage certificate and green card - anything I might need if my purse went missing. So easy. Such a convenience. This app has changed my life! Nothing easier to quickly scan a one page or multi page document. Name it, send it, save it. I hated using my scanner at home, I was always having problems with it. I bought this app and got a great new printer without a scanner and I’m so happy! I enjoy using this for my job! I Greatly Enjoy Using This Product when I travel to complete my Vouchers! Been using this for over a year and recently have stopped using it all together because I’m unable to send the documents via email. No matter what I do, the send button will never activate! We use this for work and it saves us from making trips to the office. The scanned versions are clear, easy to crop and send via text or email. I love TurboScan! It’s super fast, easy to use and worth the cost since it’s a one-time charge. A very handy app. I love using turboscan it makes my job easier. 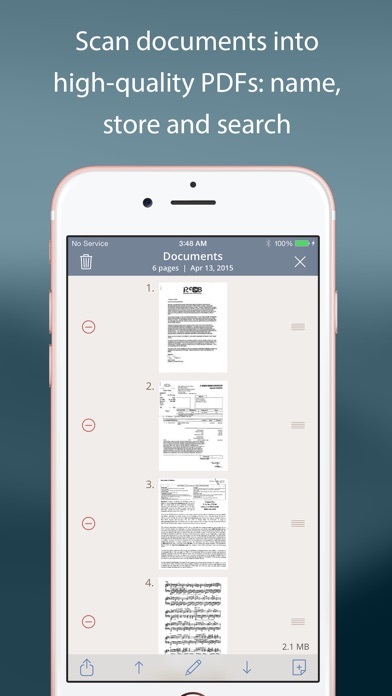 TurboScan is an awesome B2B/B4B mobile document scanner. TurboScan along with my mobile hotspot, my office is now fully "virtual". Freedom of movement & accessibility! Love it! Makes my life so easy! I like how easy the app is to use. I am able to see which scans I have emailed in for expenses and it is very convenient. TurboScan has literally changed my life. Registering my kids for school, professional work correspondence, board exams, professional profiles....you need a scanner to live today. It is user friendly, affordable and wonderful!!! I don't get anxiety when I hear the words scan, upload, JPEG etc. GET IT Now!!!! This is a wonderful instrument to work with. Copies both documents and pictures very clearly!!! This is the most useful App I have on my phone and totally worth paying for. I use it both in my professional and personal life. Thanks! I haven’t had any problems. Its so much easier than going to a printer and scanning all your papers. That takes so much time, but this doesn’t. 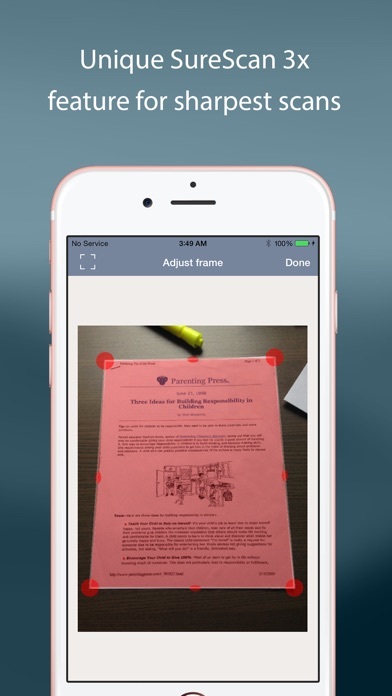 All you do is take a clear picture of what you want as a pdf, and the app does the rest. It’s amazing. Able to work on the fly! No more having to worry about scanning from a machine to a portable drive, then plugging that drive into a computer! I just click and send. Soooooo easy!